Wow, two giveaways in a row, how exciting!! What a good month to be a Yellow Dandy reader, I mean, apart from the fact that I STILL don't have an internet connection in the house and am surviving on my phones 3G, so my posts have been a bit few and far between. .. The end of this month they tell me! Anyway!! 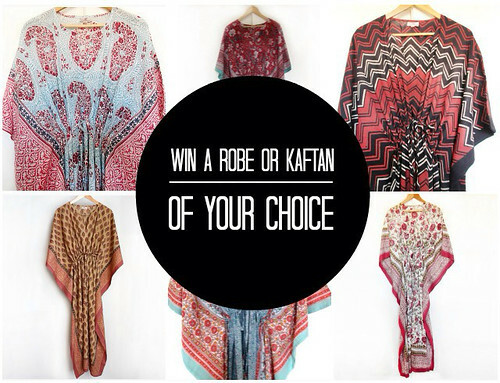 This is an awesome giveaway that I have the pleasure of co-hosting with Down That Little Lane, where Sarah from the gorgeous Be Still Homewares is offering the chance to win your choice of Robe or Kaftan! Personally I love a good robe, especially on a lazy Sunday morning, and these are so lush! I don't always get the chance to look presentable until late into the morning, so a stylish robe is the perfect way to greet the mail man, or to run down the street after kids! Ha! 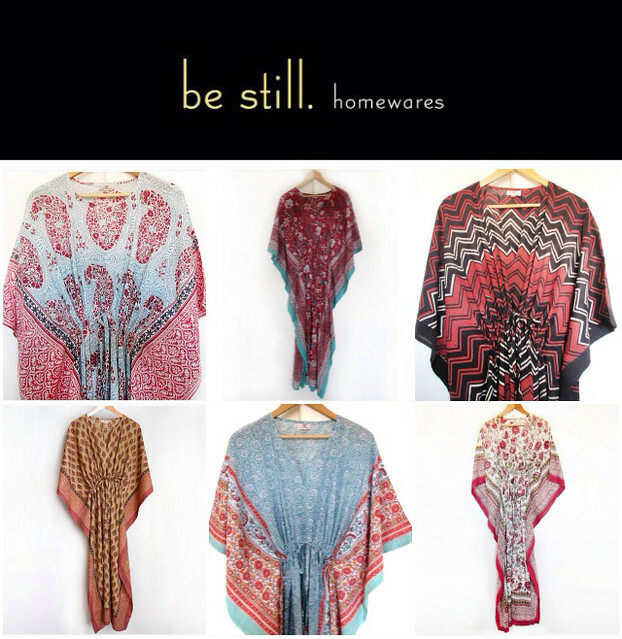 Be Still Homewares was founded in January 2008 by Sarah an Australian Industrial and Graphic Designer. Sarah has a passion for fabric and pattern and after a trip to Bangkok in 2008 where she fell in love with the gorgeous fabric that was available, she felt a need to transform that fabric into beautiful designs. The unique products created by Sarah make up the Be Still Homewares range. Sarah continues to collect and use fabric from several countries including Thailand, Japan, India, Uzbekistan and Kashmir. In 2011 Sarah further added to her collection with a range of embroidered cushions that are designed by her and produced in India. You can view the full collection from Be Still Homewares here. All you need to do to enter is leave us a comment telling us in 25 words or less - your favorite way to spend a Sunday morning. The competition is open now and closes at midnight 20/04/14 AEST. Good Luck! 9 comments on "Win a Gorgeous Robe or Kaftan from Be Still Homewares"
In the summer, Sunday mornings are all about the beach. Now it is cooler, Sunday mornings are all about the lazy snuggles with my boys. in bed! Not often that I get to read my book and have my cup of tea in peace. Waking up to my son's smiles. Then Reading the Newcastle Herald w/ my husband w/ homemade eggs Benny & bacon on the porch. Cup of coffee and a fresh pancake. Visiting the Sunday trash and treasure market looking for any vintage goodies which take my fancy.